SRI’s report on Khan Academy usage, released earlier this month, has the potential to make us all a lot wiser. They studied Khan Academy use at nine sites over two years, recording field notes, survey results, usage logs, and achievement measures, all well-specified in an 82-page implementation report and summarized in a shorter briefing. Their report has sharpened some of my concerns about the use of Khan Academy in math classrooms while blunting others. First, there is irony to be found in SRI’s reporting of usage rather than efficacy. The Gates Foundation underwrote the SRI report and while Gates endorses value-added models of quality for teachers it doesn’t extend the same scrutiny towards its portfolio company here. After reading SRI’s report, though, I’m convinced this exploratory study was the right study to run. SRI found enormous variation in Khan Academy use across the nine sites. We gain a great deal of insight through their study of that variation and we’d be much poorer had they chosen to study one model exclusively. SRI found some results that are favorable to the work of Khan Academy. Other results are unfavorable and other results seem to contradict each other. You can find many of the favorable results summarized at Khan Academy’s blog. I intend to summarize, instead, the concerns and questions the SRI report raises. It isn’t clear which students benefit from Khan Academy. Over the two years of the study, 74% of teachers (63 teachers in SY 2011-12 and 60 teachers in SY 2012-13) said Khan Academy was “very effective” at meeting the learning needs of “students whose academic work is ahead of most students their age.” Meanwhile, only 25% of teachers gave Khan Academy the same rating for students who are behind most students their age. Participating teachers don’t seem to have a great deal of hope that Khan Academy can close an achievement gap directly, though they seem to think it enhances the learning opportunities of advanced learners. But that hypothesis is contradicted by the surveys from Site 1, a site which SRI states “had some of the highest test scores in the state [of California], even when compared with other advantaged districts.” In question after question regarding Khan Academy’s impact on student learning, Site 1 teachers issued a lower rating than the other less-advantaged sites in the study. For example, 21% of Site 1 teachers reported that Khan Academy had “no impact” on “students’ learning and understanding of the material.” 0% of the teachers from the less-advantaged sites shared that rating. SRI writes: “Whatever the reason, teachers in sites other than Site 1 clearly found greater value in their use of Khan Academy to support their overall instruction.” SRI is strangely incurious about that reason. Until further revelation there, we should file this report alongside notices of Udacity’s struggles in serving the needs of lower-achieving students in their pilot course with San Jose State University in 2013. Their struggles likely relate. Khan Academy use is negatively associated with math interest. I’m going to jump quickly to clarify that a) Khan Academy use was positively associated with anxiety reduction, self-concept, and self-efficacy, b) all of these non-achievement measures are measures of correlation, not causation, and c) the negative association with interest isn’t statistically significant. But I’m calling out this statistically-insignificant, non-causal negative association between Khan Academy and interest in math because that measure matters enormously to me (as someone who has a lot of interest in math) and its direction downward should concern us all. It’s very possible to get very good at something while simultaneously wishing to have nothing to do with that thing ever again. We need to protect against that possibility. Teachers don’t use the videos. Khan Academy is shifting its goal posts here, but we should all welcome that shift. In his speech for TED and his interview with 60 Minutes and my own experiences working with their implementation team, Khan Academy’s expressed intent was for students to learn new concepts by watching the video lectures first. Only 10% of the teachers in SY 2012-13 agreed and said that “Khan Academy played a role in introducing new concepts.” Khan Academy seems to have received this signal and has aligned their rhetoric to reflect reality. The exercises are Khan Academy’s core classroom feature, but teachers don’t check to see how well students perform them. 73% of teachers in SY 2012-13 said “Khan Academy played its greatest role by providing students with practice opportunities.” Over both years of the study, SRI found that 85% of all the time students spent on Khan Academy was spent on exercises. Given this endorsement of exercises, SRI’s strangest finding is that 59% of SY 2012-13 teachers checked Khan Academy reports on those exercises “once a month or less or not at all.” If teachers find the exercises valuable but don’t check to see how well students are performing them, what’s their value? Students have a word for work their teachers assign and don’t check. Are Khan Academy’s exercises more than busywork? SRI quotes one teacher who says the exercises are valuable as a self-assessment tool for students. Another teacher cites the immediate feedback students receive from the exercises as the “most important benefit of using Khan Academy.” But at Site 2, SRI found “the teachers did not use the Khan Academy reports to monitor progress,” electing instead to use their own assessments of student achievement. Students are working on individualized material, exercises that aren’t above their level of expertise. They find out immediately how well they’re doing so they get stuck less often on those exercises. This makes for less challenging classroom management for teachers. That’s valuable. But in the same way that teachers prefer their own lectures to Khan’s videos, they prefer their own assessments to Khan’s reports. One hypothesis here is that teachers are simply clinging to their tenured positions, refusing to yield way to the obvious superiority of computers. My alternative hypothesis is that teachers simply know better, that computers aren’t a natural medium for lots of math, that teacher lectures and assessments have lots of advantages over Khan Academy’s lectures and assessments. In particular, handwritten student work reveals much about student learning that Khan Academy’s structured inputs and colored boxes conceal. Which it turns out SRI already did. Unfortunately, SRI didn’t report those results. At the time of this posting SRI hasn’t returned my request for comment. It isn’t surprising to me that teachers would prefer their own lectures to Khan Academy’s. Their lectures can be more conversational, more timely, and better tailored to their students’ specific questions. I’m happy those videos exist for the sake of students who lack access to capable math teachers but that doesn’t describe the majority of students in formal school environments. I’m relieved, then, to read Elizabeth Slavitt’s claim that Khan Academy doesn’t intend any longer for its video lectures to introduce new concepts to students. Slavitt’s statement dials down my anxiety about Khan Academy considerably. SRI minimizes Khan Academy’s maximal claims to a “world-class education,” but Khan Academy clearly has a lot of potential as self-paced math practice software. It’s troubling that so many teachers don’t bother to check that software’s results, but Khan Academy is well-resourced and lately they’ve expanded their pool of collaborators to include more math teachers, along with the Illustrative Mathematics team. Some of the resulting Common Core exercises are quite effective and I expect more fruit from that partnership in the future. But math practice software is a crowded field and, for totally subjective reasons, not one that interests me all that much. I wish Khan Academy well but going forward I suspect I’ll have as much to say about them as I do about Cognitive Tutor, TenMarks, ALEKS, ST Math, and others, which is to say, not all that much. tl;dr – “Real world” is tougher to measure than “interest” and less important overall. So rather than asking which of these three different versions of a word problem is more “real world” I asked a couple hundred people which is more interesting. Only the geometry treatment was significantly better than a coin flip at generating questions. 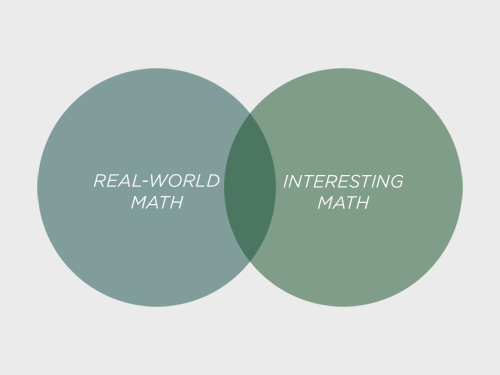 Here are some closing words about “real world” math, mostly distilled from your comments on the last post. As with previous investigations, I am indebted to the folks who stop by this blog to comment and make me smarter. What other conclusion can we draw from the dozen-or-so definitions of “real-world math” I found here and on Twitter? Their arguments may seem obvious to you. They aren’t obvious to the three people who emailed me here or these presenters at the California STEM Symposium or Conrad Wolfram or the New York Times editorial board. As Liz said, “Real world is just a means to an end. The goal is interest.” We should reject simple explanations of student interest. So Which Version Is More Interesting? So let’s ask about interest instead. I used Mechanical Turk (and Evan Weinberg’s invaluable Internet skills) to show a random version of the problem to 99 people. I asked them if they had a question or not. Why the geometry treatment? I don’t know. It’s more abstract than the candy treatment, which features objects from outside the math classroom. 88% of the people I surveyed in the first experiment answered “within the last year” to the question “When did you last use math to solve a problem in life, work, or school?” That’s a math-friendly crowd. It’s possible that a class of elementary schoolers would find the candy treatment more interesting and that a coffee klatch of research mathematicians would tend towards the text treatment. I don’t know. I’m just speculating here that real world is a pretty porous category. And for the sake of interesting your students in mathematics, it’s more important to know their world. 2014 Mar 26. Fawn Nguyen asked her eighth grade geometry students which version they preferred. Dear Mathalicious: Which Of These Questions Is “Real World”? Are hexagons less real-world to an eighth-grader than health insurance, for example? Certainly most eighth graders have spent more time thinking about hexagons than they have about health insurance. On the other hand, you’re more likely to encounter health insurance outside the walls of a classroom than inside them. Does that make health insurance more real? I don’t know of anyone more qualified to answer these questions than our colleagues at Mathalicious who produce “real-world lessons” that are loved by educators I love. I’m sure they can help me here. Here are three versions of the same question. Given an arbitrary point P on a line segment AB, let AP form the perimeter of a square and PB form the circumference of a circle. Find P such that the area of the square and circle are equal. When do the circle and the square have equal area? Where do the circle and square have the same number of candies? You and your friend will get candy but only if you find the spot where there’s the same number of candies in the square and the circle. Where should you cut the line? Imagine you were a contractor and your building swimming pools for a hotel. Given that you only have a certain amount of area to work with, your client has asked you to build one square and one round swimming pool and in order to make the pools as large as possible (without violating certain municipal codes or whatever), you need to determine how these two swimming pools can have the same area. Farmer John has AB length of fencing and wants to create two pens for his animals, but is unsure if he wants to make them circular or square. To test relative dimensions (and have his farmhands compare the benefits of each), he cuts the fencing at point P such that the area of the circle = area of the square, and AP is the perimeter of the square pen and PB is the circumference of the circular pen. Which of these is a “real world” math problem? Or is none of them a real-world math problem? If anybody else has a strong conviction either way, you’re welcome to chip in also, of course. Ginny Stuckey asks if I’m trolling. Matt Lane asks, instead, if the task imbues people with joy for mathematics. These are the two ideas that seem to be confused here are just “real world” and “interesting”. There seems to be an inherent assumption that they are somehow related when I doubt they even should be. Sometimes they will overlap, and sometimes not, but it is a bit random and quite personal in my opinion. The problem probably lies in the many ways that one could define “real world”. What qualifies as “real world”? A problem simulating a project/job/task being performed by someone performing their normal job duties, such as the example of the contractor building a pool to meet municipal code? Is a problem involving objects or tasks that would be considered an experience students are likely to have “real world”(dividing up the M&Ms to be equal size)? Actual evidence of math in the “real world “(video or otherwise) being applied as a part of someone’s job (the maintenance staff example above from @Kevin Polke) could qualify, or perhaps the application of math to a problem that is foreseeable in that person’s job duties. I think it’s best to take the more pluralistic viewpoint on this one, as it would be quite a task to attempt to statically define the exact nature of “real world” math, as there are always countless more examples lining up to disprove whatever narrow definition you choose. “Real world” is just a means to an end. The goal is interest. I’ll say again though: I don’t really care if a problem is real-world. There are so many great problems that aren’t, and so many terrible problems that are. I don’t think it carries huge added value. Everyone decides what’s “real” to them (as Jeff P said). Right now for my kid, 7-5 and 5-7 being related to one another is plenty real, even though there is no connection yet to physical objects or money or any of that. The aim of Shell Centre Publications has always been to ensure that a number of seminal works in the field of mathematical education remained available. We have now reached the point where our most popular items are out of stock, and have come to the decision that it is time to stop storing and selling physical books. Digital distribution is the best way to keep these works available, so in the coming months, we will be making many of the publications on our list available, for free, as PDF downloads. These books are just great. The Language of Functions and Graphs, in particular, has a couple of career’s worth of great activities, lesson plans, and essays on teaching functions. Highly recommended. I’ve been teaching for over 25 years and this is the best way to document what it is that happens in classrooms. A friend looked at my blog and then said to me, “Now I get what it is you really do.” Of course we can never actually capture all the moments, both large, small and in between, but I think all of our blogs together can do that. And in the climate we find ourselves in today I think that is very important. Joe’s blog is one of my favorite recent subscriptions. You should subscribe. It’s really hard to find dedicated elementary math teacher bloggers for a lot of really good reasons. In particular, they generally teach everything so why would they specialize their blogging. All of this makes Joe’s blog invaluable. What would happen if we took a problem apart and put it back together?